In Baianat we think of branding as the master key to uniqueness and authenticity. Our production, social media efforts and business decisions are made with regard to the whole brand experience. Did you ever walk into a shop and smell a certain fragrance in the air and when you buy a piece of cloth you find the same smell in it? Or have you ever been to a restaurant where they play a certain type of music, like classical piano or jazz? You might be thinking "Oh those guys are nice and making the mood cool". But actually, they are doing branding themselves to you as classy restaurant or fancy clothes shop. Those fragrances and sounds we meant to be this way to complete the brand identity. Branding is becoming the keyword of the era and the industry of millions of dollars' income. It gained a huge popularity as it facilitates the process of choosing for the customers, works as a certificate of guarantee and helps salesmen with closing deals. Google doesn't need to convince anyone with its abilities to close deals because their brand name did half of the game already. Both individuals and businesses are trying to leverage on the power of branding knowing that it's the only way for surviving the cut-throat competition. And although branding is not just about the visuals, the majority are still looking at the logo redesign and printings as the whole branding activity. Their narrow view of the branding process makes them neglect the strategy, research and other elements that make brands alive and give it the personality needed for making impressions and having a seat on the VIP table of its customer's mind. Things like smell, voice, tone, feeling, and texture are all elements of the brand identity system. "Brand identity it is what appeals to all senses. You can see it, touch it, hold it and watch it. It fuels brand recognition & differentiation as it takes different elements and unifies them into whole systems". Digitally, some of these elements can't be fulfilled but it can be conveyed through the offline channels and close the circle with the digital side. The process may seem hard at the beginning but as we experienced it in Baianat and broke down all the elements to stages we managed to overcome the challenges by working as a team and that's the point. Branding is a team task not a freelancer one time duty. 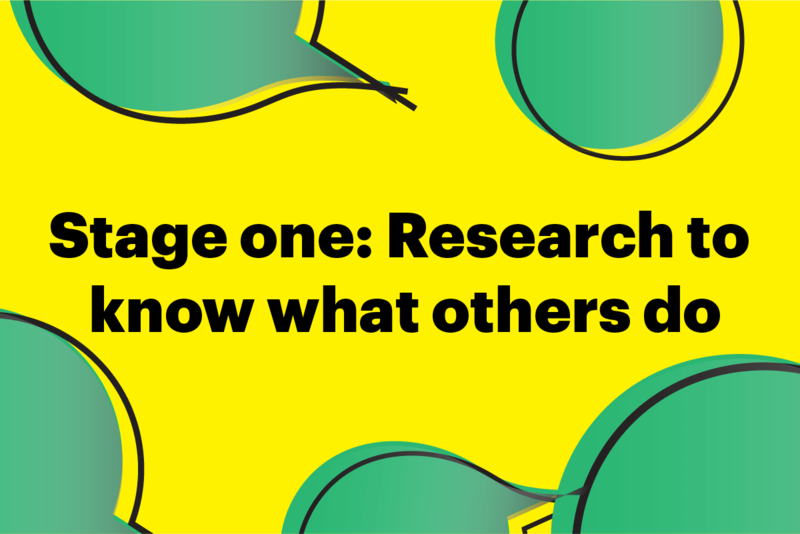 Research to know what others do. Strategizing to differentiate from what they did. Designing the basic visual elements. Creating the whole brand system and shipping it! Monitoring to know how you did. But as we are more keen on the strategic part of the branding process and how they can contribute to the overall business goals, we will be discussing the first two stages of the process. You can find further articles in the design lab about designing the visual elements of the brand. 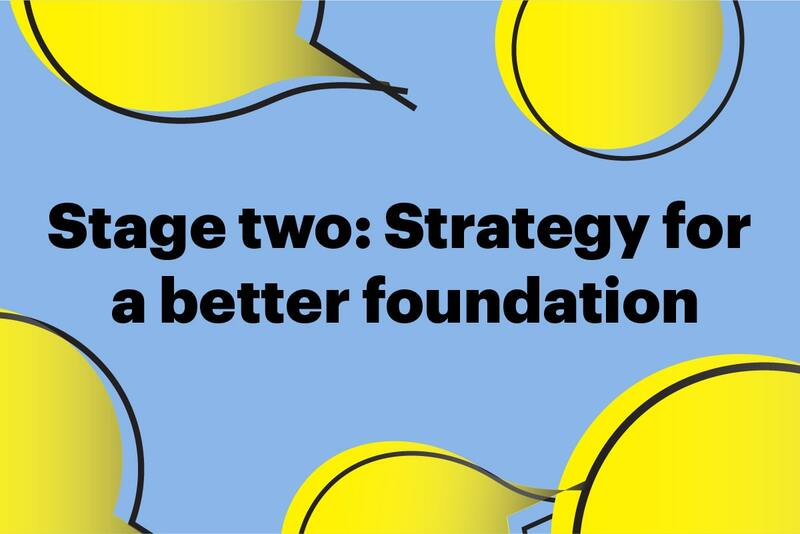 The research is the foundation of your brand strategy. Quick and dirty research or lack of information might lead to creating a disaster than a brand. You need to take enough time to look through everything. Start by your industry in general. Look for the trends in design, color palettes and logo types. Then narrow the scale and analyze your top three competitors carefully. Look for things that makes them a brand or formulates their identity. Is it their language or the contrast of the colors they use? Most importantly, don't fall in love with what you see, just try to learn from it and look for inspiration. Study every signal they transmit. Every industry is different and has certain parameters, what works for healthcare will not work for wood production and you should pay attention to this. How they are talking to their clients, about themselves, and on critical issues like legal and privacy concerns. Are they friendly in general or more into corporate style with Ms. And Mr. written everywhere. What design patterns and trends are they following? Are they using Google material design system? What kind of graphics are they using for the website? Is it all imagery or there are GIFs and illustrations as well? Don't exclude your research to this this list. Identify other important stuff that matters from your point of view and according to the nature of your industry. The goal of the research is to help you have a clear picture of where you stand and where are the gaps and positioning opportunities. You can also rely on your customers and brand advocates for more insights on what they think of certain brand elements. After gathering all the information, it's the time for the analysis step. Organize everything in a logical manner and set the stage for clear observation. You might find that all the brands in your industry are following certain color palette, design trend or promising the same high quality services. Just stick with what represents who you are and don't get fascinated with what you're seeing and let that hinder you from creating something you could be proud of. While designing our website, we searched for what kind of trends are prevailing the industry, we analyzed everything for just getting familiar. As we follow a blue ocean strategy, studying the competitors is not a fundamental element in our decision making process as being blue means creating something unique that no one did before so you can never look for previous past experience. There are none! So if you have a blue ocean strategy in place, make sure you don't imitate what you see in your research. After all the analysis, you need to draw up your conclusions in a document. The format doesn't matter as much as the information you collected. These are the things that will articulate your brand strategy later on. The second stage of the process is about choosing your sailing direction and setting the brand boundaries. Your strategy is not holy so you can always change and edit freely until you find the best combination and lower your anchor. No brand can target the whole customer segments in the world. it should identify its unique targeted audience and define their characteristics. The brand persona will help in crafting a more customized message and let your brand communicate better. Through the brand persona you will identify the problems facing your targeted audience, what are their three different brand personas. Technical who are students and people working in the field. They are mainly interested in learning more or seeing how we do things behind the scene. Clients who are interested in knowing how we can help them or what are our previous works. And the public including organizations and individuals who are just brand lovers and evangelists. After identifying your brand ideal profile, you need to set the USP or UVP for your product or service. Since you already have done your market research and outlined your competitors inside – out you are aware pf their weaknesses and strengths. You know what type of employees they have, how they run the inside operations and how to do better. Now it's time to write down this in the form of your unique value proposition. Your value proposition could be an emotion not necessarily a feature or some sort of after sale services. Most importantly, it shouldn't conflict with your brand mission and be of value to your audience. It's not that they were lost. But we never thought of documenting our core values. And through the branding process, we found it critical to outline them as they represent a huge part of the brand personality. The documentation process didn't take long as we almost agreed on these values and told them during the interviews repeatedly so we know them by heart. Before working on our website design, we started reviewing our business goals and long term ambitions. We wanted our visual identity to communicate with what we are planning for in the business background. And as a cultural business, a good place to start was reviewing what we believe in. We asked ourselves whether our culture is still a fit to the people inside Baianat. and whether our values are still what matters to us and drives us every day. After refining, we came up with our culture book as a first step in our identity forming process. The book is not like code of ethics or any other manual you can find. A tagline is a short phrase that helps create interest. It captures the company brand essence, personality, positioning, and distinguishes the company from its competitors. And this is where the tricky part comes. Imperative: starts with a verb. Descriptive: describes the service or brand promise. Superlative: positions the company as best in class. Specific: reveals the business category. When we were thinking of our tagline we went through all the different types as we had much in mind. We created a lot of drafts at first as our ideas fluid, we were more ready for trying more and refining for a better version. Yet every sentence we came up with was missing something that we needed to indicate about ourselves. The doodling was running for days and weeks. We asked all the team members to contribute in the ideating process. We were trying to highlight everything we do as a business and give a sneak peek of our culture and values as well. Every line added to the drafts contained a word we loved and felt was most expressive. So we started highlighting those keywords we fell in love with. And they came up to be innovation, authenticity, digital, and humanity. We kept those words in mind trying to combine them all in a sentence of only five words (because the site design required this). And by considering our vision and mission we got the spark! We found our lost tagline! So we're still those crazy guys who dream of changing the world by making.
" Authentic solutions through digital innovation "
Every brand has a promise. This is the basic " Hi, what's up " by which each brand should start the conversation. Taking your brand promise for granted and writing down some cliches won't save the day. If you're not the number one in the industry just don't write it/ if you will not get back to your customers in 5 minutes don't do in the recording message. And if you're not the most secured cloud hosting service ever. please don't fool people for money. There is nothing that can damage credibility more than an unfulfilled promise. There is no secret way of setting your brand promise actually, the process we followed was very simple. We asked just one simple question, what do people need most that we can constantly offer? Authenticity, that's it in one word. We commit to delivering unique work and experience every time. Brands are the way for companies to connect emotionally with customers, become irreplaceable and create lifelong relationships. We don't usually find people falling in love with chocolate bars or hating the fridge because it has a different point of view. You will find them talking to the brand itself. Unconsciously, a certain emotion has been developed in their minds about the personality they are dealing with. And as brand identity designers, if we didn't draw a precise personality and left everything for the end user determination we won't control the impressions created. This is why tailoring a s personality aligned with the company products, targeted audience and mission is an nonnegotiable step. When we were building up Baianat personality, we wanted to be close to humans. A friendly yet reliable and professional brand that relies on science and ready to share everything with the community to boost the world. We created a list of the words tags and looked for the most convenient things that describe our brand identity. We highlighted three main brand attributes! We choose the human characteristic to show our authentic side and complete our culture and values. However, our personality is practical and solution oriented. We demonstrate dynamic behavior, strategic thinking and proactive. So we're visionary as well as our brand aims for innovation and inspiring humans to unlock their potentials. Brands are like humans in many aspects, not just they have personalities but also voices through which they communicate with the world. A brand voice is the main way of communication for brand personality through different channels and also used for determine the brand tone in different situations. And as our voices as humans are aligned with the characteristics we have brand voice should match up with the whole planned identity. You can't have a brand with a classy personality and use words like, what's up folks! in your emails. Or a brand with a funny personality and use words that sounds so serious. People will find you strange or maybe schizophrenic. They won't relate to your identity and in this case they won't be able to build a strong relationship with you as they don't understand the character to love or hate it. It's important to select your brand voice based on research and strategic reasons. Imagine if your brand were a person, how would he respond to his clients? Would he be so formal and informative or more hippy with a slang! In our case at Baianat, the verbal identity was extracted from the brand characteristics then we added a little more clarification for better understanding from the writer's side. Which means that our voice is human as it talks to educate and benefit the community. We are also customer centric and avoiding the sleazy language. We walk by values, demonstrate clarity and cooperation and despiseelectronic automatic replies. And since we're practical, you can find us talking our customer's language and creating tow ways conversations. This enables us to understand their needs and act upon it rapidly. We don’t talk much and when we talk we breathe energy in the air. We are also visionary and talking about the future and possible innovative ways for doing the regular normal work or connecting the dots. We don't have the same reaction to all the situations. When someone throws us a birthday party, we don't just say thank you in a bland way. We do something more like " WOW. THIS IS A SPLENDED SURPRISE THANK YOU! The normal thank you works for other situations like when someone holds the elevator door for you. And as every situation has its own reactions, each person should be treated differently as well. Like you can't talk o a little child the same way you talk to adults. Brands can't do that too. "Baianat, Inc. will not make any contributions of resources such as money, goods or services to political candidates or parties." The tone varied alot as we were addressing a sensitive matter to our audience. On contrary, in this piece of content we're using a more talkative tone like the one used in our culture book. Our voice is still the same in both versions but the tone is different. We're more like a wizard, changing our skin in accordance with our surroundings. Positioning happens when we book a spot in our customer's mind. This spot could be a word or certain impression like professionalism or honesty. And in order for positioning to be effective, a process should be followed for determining what kind of positioning suits the brand. A unique value proposition must exist to rely on that affects people's lifestyle and perception. When FedEx started they positioned themselves as the express delivery service, they will get your stuff overnight. And just like FedEx, Zappos also gained a lot of popularity due to its customer centricity positioning. We go through all the research conducted in the first phase of the brand identity creation process and spot on the direct competitors and their positioning values. Then we start crafting the thing that makes our brand unique. Insights from the customer feedbacks can bring more distinct ideas into the house for writing our brand positioning statement. After creating the statement, we check its reliability to the market, the targeted audience and the industry. We make sure that the positioning is not for the sake of differentiation only and that it will truly benefit the brand growth, vision and ambition. The statement will be used internally as a guide for people working inside the brand so It should be understandable and easy to digest and emotions evoking as well. 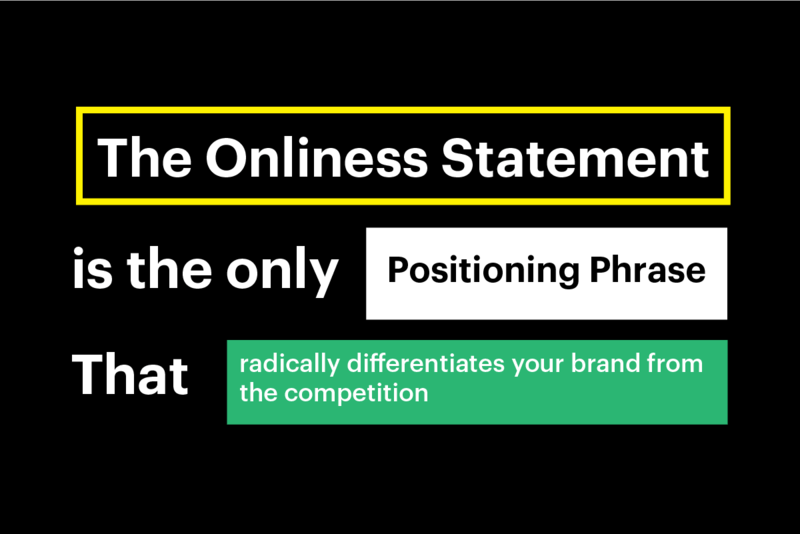 While ideating we use exercises that help igniting thoughts in our minds and for the positioning statement we use the onliness statement as it's simple enough yet helps ideas fluid smoothly by filling the gaps. The digital foundation brand that produces authentic, strategic, brand driven production for ambitious and game changing customers around the world who want to create a true value and impact people’s lifestyle while everyone is concerned about profits. Brand stories shouldn't sound like sales copies. This will impact its effect and weaken its ability on building trust. If they're not honest and truly expressive of the brand vision and what it does they're just useless. Brand story is the tool for starting a conversation and humanizing your brand not a marketing material or place where you will be showing off your abilities and company strong points. So it has to be about your customers not your brand. In Baianat while telling any brand story we first understand the business. We identify the targeted audience around whom the whole story will be knitted. Then, we study the industry well in order to position ourselves through the story. Include feelings, facts and interpretations.